Properties in Carpenedolo average 4.5 out of 5 stars. Apartment for 4 people on the ground floor, nice and cozy. Property 11: Apartment for 4 people on the ground floor, nice and cozy. Directly on the lake with private beach. Playground, sports facilities. Property 13: Directly on the lake with private beach. Playground, sports facilities. La Casa di Gio '- Hilly apartment overlooking the Lake, with swimming pool. Property 23: La Casa di Gio '- Hilly apartment overlooking the Lake, with swimming pool. Rent apartment on the first floor proximity Virgilio spa. 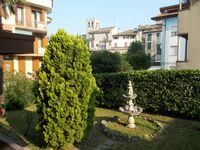 Property 40: Rent apartment on the first floor proximity Virgilio spa. APARTMENT "5 - PUNTA SAN VIGILIO"
Property 48: APARTMENT "5 - PUNTA SAN VIGILIO"
Great apartment in a Beautiful town. Owners were very helpful and accommodating! The neighbors above were noisy but other than that we enjoyed our stay very much! Everything was perfect. Elana communicated with us before arrival. It turned out to be convenient for Elana's sister, Ida and Ida's husband, Paulo to pick us up at the train station and show us around the apartment and the town. The apartment is comfortable, immaculate and well appointed. We were here 11 days and enjoyed every single moment of the apartment, Desenzano and Lake Garda. It is a perfect location to feel a part of the community. Ferry service to other communities on the Lake is convenient and restaurants and shopping in Desenzano is the best of anyplace on Lake Garda. We could not have been happier with our choice. Thank you Elana, Ida and Paulo. We recommend Carpe Diem without reservation!